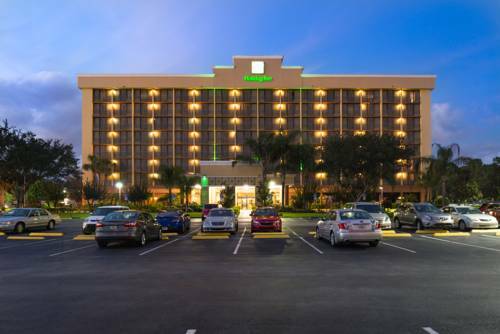 Enjoy a magical, family fun vacation at the Holiday Inn Orlando SW Celebration Area, only minutes away from Disney Parks, ESPN Wide World of Sports Complex, Old Town Kissimmee, Fun Spots and great shopping at our outlet malls. The Holiday Inn is an official Walt Disney Good Neighbor hotel. All our guests will enjoy the business and fitness centers while the children relish in our kid friendly amenities including an outdoor pool, playground, and video game room. Reminisce with Mickey Mouse at the Walt Disney World resort in Orlando. See the characters come alive at Magic Kingdom. Travel to futuristic times at Epcot Center. Witness pure movie magic at Disney's Hollywood Studios. Slide and splash away at Blizzard Beach and Typhoon Lagoon. Children's program - Our full-service hotel features a kid's outdoor pool, an outdoor playground, and a video game room for fun filled entertainment. Falcons Fire Golf Club is recognized both regionally and nationally as one of the finest public golf courses in Orlando. This Reese Jones designed championship golf course and the spacious Clubhouse offer guests a spectacular venue for any occasion. The Happiest Place on Earth The Magic Kingdom, Animal Kingdom, Disney's Hollywood Studios and Epcot. ESPN innovation and entertainment joins the magic and service of Walt Disney World Resort at this 220-acre sports complex, host of more than 60 sports and thousands of events for athletes of all ages and skill levels. A dinner theatre offering a two hour show and a four course meal. The Orlando attraction that has it all. Would-be pirates of all ages will become a part of this epic and interactive pirate show at Pirate's Dinner Adventure! Vegetarian meals also available. Universal Orlando Resort-Home of the new Harry Potter Village. Rides, shows, restaurants, shopping, dinning and entertainment. Visit the beautiful beaches on the East Coast. Be sure to visit Daytona Beach where you can drive on the beach. Home of the Florida Classic, Champs Sports Bowl and Capital One Bowl. See the many wonders of the sea! Be sure to see the whale shows. Visit Aquatica which is a one of kind waterpark . Swim with the Dolphins at Discovery Cove. The alligator capital of the world! Gators, crocodiles, birds, bears and so much more! The Silver Spurs Rodeo is the largest rodeo east of the Mississippi and is annually ranked among the top 50 events sanctioned by the Professional Rodeo Cowboys Association (PRCA). Orlando destination for luxury brand shopping.